, 59, appeared before Magistrate Alex Moore at the New Amsterdam Magistrate Court today charged with the possession of narcotics for the purpose of trafficking. 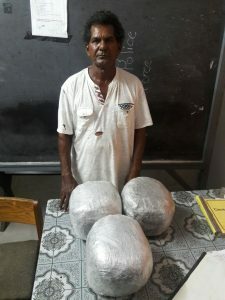 The court heard that the defendant on Monday 9th October at Highbury village, East Bank Berbice, he had in his possession 6,204 KG of cannabis for the purpose of trafficking. Police on Monday acting on information intercepted a motor car HC 2449 driven by the accused on the East Bank Public Road. A search was carried out and police discovered three parcels inside of white salt bag containing the illicit drug weighing 13 pounds. He pleaded not guilty to the offense and was denied bail. The accused, who was represented by Attornery-at-law, Charandass Persaud, was placed on remand until November 3rd, 2017.